Peripersonal space (PPS) is an area created by the brain immediately around one's own body parts that is used when interacting with people and objects. Recently, researchers have shown that some neurons in the primate brain respond to an infringement of another person's PPS as if their own space was being encroached upon. To determine how this "PPS remapping" phenomenon affects human behavior, Kumamoto University researcher, Dr. Wataru Teramoto, evaluated people's reactions to visual or tactical stimuli while alone or with a partner. He found that participants responded to stimuli in a partner's PPS as quickly as they would their own. The experimental setup used three types of stimuli, tactile only (T-only), visual only, (V-only), and visuotactile (VT) for multiple kinds of experiments. Participants were instructed to press a button with their right hand as quickly as possible in response to any of the three stimuli: a vibration in their left index finger, a change in color of a moving disk (white to green) projected onto the table in front of them, or a combination of the two. Experiments were performed alone, with a partner, or with a fake (rubber) arm. The visual stimuli appeared either inside or outside of the participant's PPS, with the latter space corresponding to the partner's PPS. "Participant responses should be similar between approaching (toward the participant, in the participant's PPS) and receding (toward a partner, in the partner's PPS) stimuli if PPS remapping is a naturally occurring phenomenon," said Dr. Teramoto. "And my data has shown strong behavioral evidence supporting remapping." Indeed, the participants in the first experiment responded more quickly to stimuli approaching them or their partner compared to when the stimuli receded from them when no partner was present. 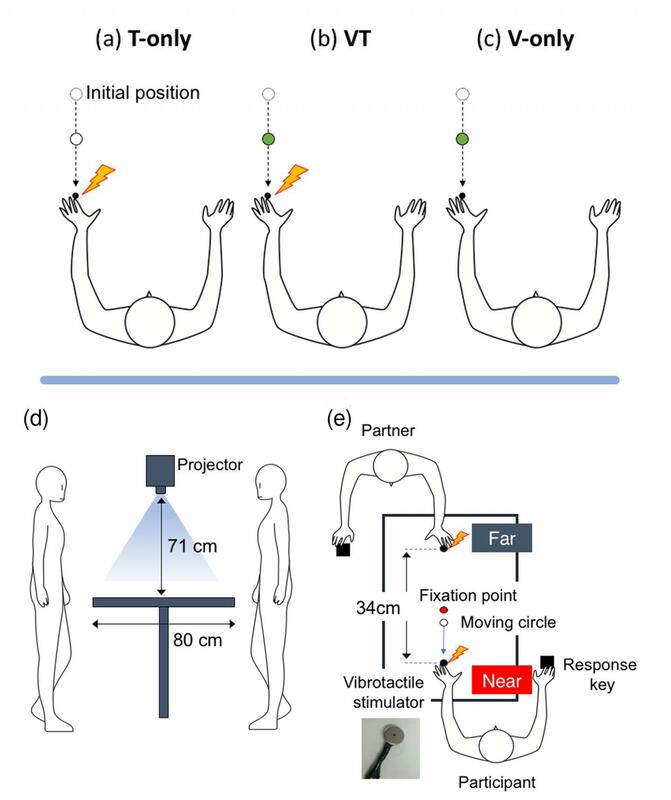 The second experiment showed the effect even when the participants did not know their partner, and showed that it was not present when a fake arm was used instead of a partner. In the third experiment, the PPS remapping effect was seen even when the participant and partner used different body parts. "The brain appears not only to be able to show us when something is nearing us, but it is also able to let us know when it is happening to someone else," finished Dr. Teramoto. "Further research into this effect is certainly warranted to clarify some of the issues that appeared in this experiment, such as the effect of distance on receding stimuli or whether a certain direction of movement is favored." This work was published online in Scientific Reports on 3 April 2018.